Well it's been a sad week for fashion. I know lots has been said about the tragic passing of Alexander McQueen and there's not much anyone else can add, he was so fantastic and at the peak of his career. 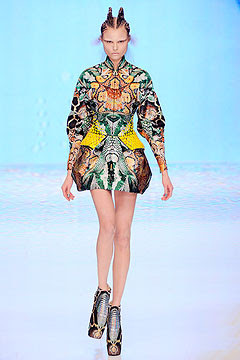 The look below comes from his S/S10 collection, inspired by Darwin's theory of evolution. Truly amazing, he really made fashion fantastical. What a wonderful fashion designer he was.